Jim Kisler joined the company as a business development manager for the NorCal region in 2015. SAN DIEGO – LandCare appointed Jim Kisler as its branch manager for its location in Tacoma, Washington. Kisler joined LandCare in 2015 as a business development manager in the NorCal region. Kisler has worked in the green industry for over 30 years, having worked at his grandfather’s avocado ranch in Santa Barbara, California, in high school, and then at a local nursery while attending Arizona State University. Kisler was excited to join the team to help grow the northern California market a few years ago. Kisler said he looks forward to expanding his leadership skills in the Pacific Northwest. Choosing the right plow attachment can get your fleet through the winter. 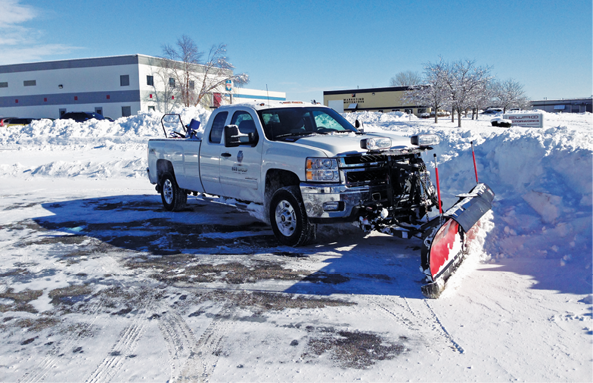 John Derringer, owner of John’s Lawn & Landscape outside of Sioux Falls, South Dakota, has a fleet of seven pickup trucks that stay busy all year round, hauling landscaping and lawn care equipment in the summer and plowing parking lots in the winter. Derringer makes sure his crews all check the weather the night before their shift so they know if they need to show up early to equip trucks with the right equipment. He used to have crewmembers show up early every day during the late fall months, but realized he was wasting man-hours. Derringer just updated his fleet two years ago, and here’s what he considered when he was shopping around. Weight: Derringer says his No. 1 concern was finding something that was the right fit for his trucks. “I use them all day every day, so I don’t want something too big that’s going to put a bunch of strain on my fleet,” he says. Support: Since downtime is a real killer, Derringer wanted to make sure he could easily repair his plows. So he looked for a dealer that would keep him up and running. “That relationship is really important,” he says. Blade: Derringer considered moving to V-plows this year but decided against it since he’s had good luck with straight-blade plows in the past. “If it’s not broke, don’t fix it,” he says. He also says that material options are important to consider. A few years ago, he decided to move away from steel blades and start using polyethylene plows. Derringer says they cost a little more, but they’re worth it. The Great Recession spurs reinvention for an Indianapolis company. Today, the company services just shy of 40 million square feet of asphalt, and 3 million square feet of sidewalks. Clients typically include medical buildings, office buildings, industrial and retail properties. B&B Group employs a combination of longtime seasonal employees, fulltime staff and subcontractors to provide snow removal services. In addition to specializing in specific services, Mangin says the company also now specializes in how service is offered. Contracts vary. Some are for one year or one snow season, covering November to May, and some contracts are on a two- or three-year term. “There is a little bit of variability, but, again, we specialize. And what we want is that high scope, high expectation. We don’t have a big menu of different services or scopes that they get to pick from,” Mangin says. The customers who need this level of service are often hospitals or medical facilities – properties that have a higher liability risk or that need extra attention to detail. Large residential properties, for example apartment complexes, that want a 3-inch trigger are not their target Mangin says. “We’re just not a good fit for them,” Mangin says. Customers are found via long-term relationship building and referrals, he says. The white season in the area typically begins at Thanksgiving and runs until St. Patrick’s Day. The company’s approximately 250 subcontractors come in every year to watch in-house filmed training videos, regardless of how many years they have worked with B&B Group. It’s usually a half-day commitment, which is then followed by a company-wide kickoff meeting, usually the first week of November. “We feed everybody. We go through expectations for the season. We collect paperwork. We let them know what they can expect from us. A lot of times, we’ll give property assignments out at that time,” Mangin says. Then, once the winter season closes, a debriefing takes place, looking at everything from employee use and performance to customers. During this time, the company’s two full-time mechanics will also inspect and service all vehicles. They take note of new equipment that needs to be purchased and then all vehicles go into warehouse storage during the off-season, Mangin says. B&B Group employs about 20 full-time individuals year-round. During the winter, they add subcontractors, along with another 20 hourly seasonal employees and salt truck drivers. “In the winter we’ll have about 250 pieces of equipment running. It kind of works out to be about the same in labor – about 200 to 250 laborers,” he says. Like customers, subcontractors and seasonal employees are found through referrals and previous working relationships, Mangin says. Most work in seasonal trades with a slow winter. “We’ve been at this long enough that a lot of those seasonal employees come back to us year over year,” he says. Internally, the company has 16 salt trucks, about 10 pickup trucks and two or three work trucks, which are used by the company’s sidewalk crews. While B&B Group has been able to staff adequately in the past, Mangin says more challenges are beginning to creep up. Mangin understands the appeal. In those centers, hours are predictable and guaranteed, and working conditions are warm and dry. But there are still many who see the appeal with snow. Learn the truth behind some of these common myths regarding online marketing. Marketing is everywhere in contemporary America. Advertising is a branch of pop culture, and especially creative campaigns can dominate the public conversation alongside the latest TV and movie hits. The Super Bowl is now almost as much a showcase for the best in marketing as it is the pinnacle of football. But even these big-budget showpieces can miss the mark. Professionals with experience in other areas of business often want to get involved with marketing because it seems easy and fun. While these professionals mean well, they can be susceptible to common marketing myths that can lead to wasteful spending. In my 13 years of consulting with CEOs and more than 30 years in marketing across many business categories, including lawn care, I’ve seen these same misconceptions. Beautiful pictures plus attention-grabbing copy equal successful marketing. Effective marketing is driven by research and strategy. Several people sustained minor injuries and some plants were left significantly damaged. PELLA, Ia. — Seven people were hospitalized with minor injuries at Vermeer Corp. in Pella, Iowa when storms hit the agricultural equipment manufacturing facility Thursday afternoon. Visitors were also gathered at the plant to celebrate Vermeer's 70th anniversary. Read the full story from the Des Moines Register here. UPDATE: According to local radio station KNIA/KRLS work has resumed at many of the plants. and safety.” By 9 a.m., their first piece of equipment rolled off the line. Andringa and key leadership spent the better part of Monday holding informational sessions in Pella, Knoxville, Eddyville and Newton for team members who have not yet returned to work. As of today, 72% of employees are back, with intentions to grow that number daily. “I’ve never been more proud or inspired by this team. The progress already made is obviously incredible. We are rebuilding and we will come back stronger than ever. We already are.” Andringa said. For the full story from KNIA/KRLS, click here.